If I could summarise this year I would say it’s the year I stopped being a man who runs and became a runner. That may sound a bit odd but despite having run for as long as I can remember I think it’s only this year I’ve truly become a runner. In the past my running has always been in fits and bursts, picking up either when I’m feeling fat and unfit or when I have a race to target. But this year it’s been truly consistent, week in and week out always running. I’ve only had maybe 2 or 3 periods of 7 days where I haven’t run and they were either through injury or a conscious decision as recover after a big race. I feel like a completely different person to the one sat this time last year planning the year ahead. I’m a good couple of inches smaller on my waist for a start, but more importantly feel good. I’ve never felt this fit before and it’s a great feeling isn’t it? Feeling lean and strong and mentally healthy too which is potentially even more important. I’m also feeling fairly satisfied at ticking off a couple of races from my bucket list; finally doing the Scotland coast to coast is awesome, such an amazing race across incredible scenery. Also enjoyable having done it as a pair with my brother, having someone to share it with makes it somehow more real I think. I feel like I learned quite a lot about myself doing that race as well, not least from being able to keep going for over 11 hours and covering such a huge distance under my own steam. Then of course there was finally popping my marathon cherry and all because I got my London marathon rejection letter through. I decided to just get on with it and do a marathon rather than talking about it and hoping to get into a big city race. Doing the Broadway marathon was more in keeping with me anyway and the stunning Cotswold countryside certainly made for a nice backdrop to the race. Beyond those 2 big races there was a half marathon PB in the Neolithic half marathon, a race that was an awful lot hotter than I expected but finishing at Stonehenge is a pretty cool experience. There was also the race that started the year; a 10k in Bath in thick snow covering the other extreme temperature wise. In journalistic terms this was a breakthrough year, one where I learnt an awful lot about running and definitely one that has given me the confidence to take on bigger challenges. As we move into 2014 that’s exactly what I’m starting to think about, what’s the next thing to tick off the bucket list? I know I train better with something to aim for so time to start getting some races in the diary. Plus I hope 2014 will be the year that I manage to get to a Write This Run conference, gutted to have missed the first 2 due to other commitments so the next one is a must do! 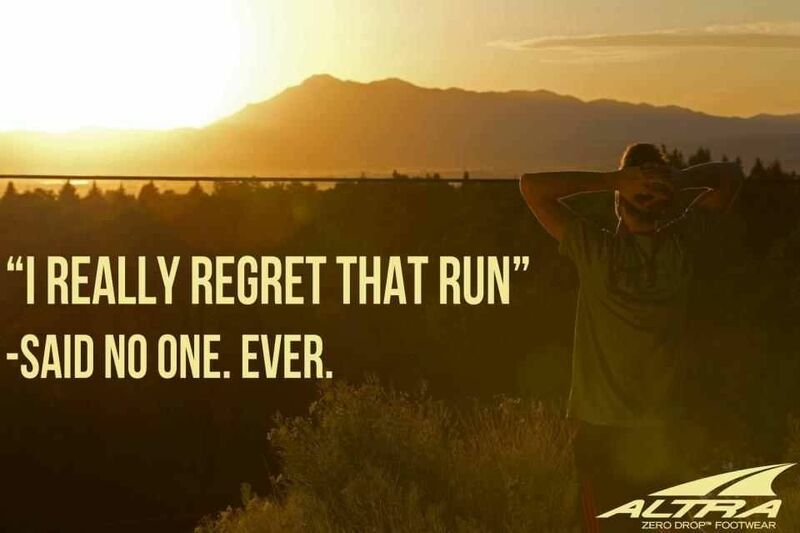 Happy new year everyone, I’ll leave you with my running motto. This entry was posted in Races, Training and tagged broadway marathon, bucket list, marathon, Races, scotland coast to coast, year in review. Bookmark the permalink. I love that it gets me out into the countryside and is really the most peaceful part of the day for me. Fab post. I don’t run as often or as far as you, but I’ve considered myself a ‘runner’ ever since I started doing half marathons three years ago. Before that I was someone who runs (I used to do three miles a couple of times a week just to keep fit). I was gutted when my sister got me a present with lots of words that represent me and one was ‘jogging’. In my mind, jogging is what slightly overweight women do without picking their feet up off the ground. It’s not what people who do half marathons do it. The word irks me so much! I look forward to reading about more of your races in the coming year. Who knows, one day I might join you on that Broadway marathon! Just about 3 miles a day… Not a bad target, not a bad target at all. I’ve got to get back into running properly this year, given that Lincolnshire’s nice and flat. Problem is finding somewhere to run safely – far more traffic here and precious few footpaths and decent verges to run on. Still, I’ve a good 3-miler from my front door that can be extended by judicious use of the paths. Definitely blessed here for running, but when you like running off road you can generally find safe routes on footpaths and bridleways in most places.